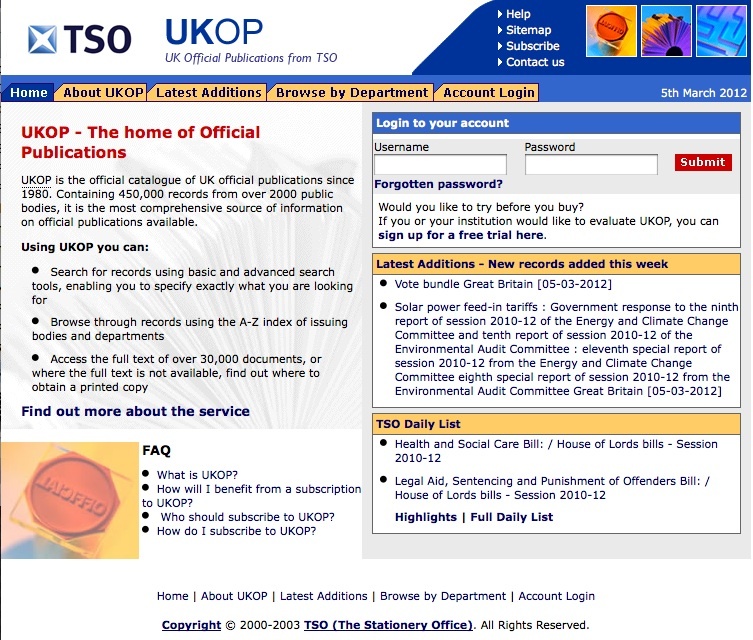 The United Kingdom Online Publications is a website published by the United Kingdom Stationery Office, giving access to all the official documents produced by the Government. It is online from 2000 and it works both as an archive and as a documents locator. It gathers 450,000 bibliographic records of official publications from 1980 onwards, over 20,000 links to governmental documents, more than 12,000 documents permanently archived in the website, including a section with the latest daily additions. The site offers full-text version available in pdf, with comments and a brief description in html. Access is quite limited. No free material is available. Visitors can access only limited information and they can only view documents located in the latest additions area. A two weeks trial account for non-subscribers is allowed but the request has to be evaluated before being proofed. Membership is possible on an annual paid subscription basis. Pay-per-download of a single document is also possible with prices depending on each file. The website is simple to explore and the search engines are multiple and well developed, endowed with full explanations, making data retrieval very effective. are databanks which contain governmental outputs as laws, statutes, regulations and court opinions at various levels of the political system (from legislatures to courts and beyond). One of the most well known databanks is THOMAS, the online service of the Library of Congress created in 1995 to make federal legislative information freely available to the Internet public. In order to ensure the transparency of the political process and decision-making, official records databases are usually freely searchable and downloadable.